When I was finishing off the last of the challah I made the week before I made this one, I was trying to figure out what to do with some leftover cranberry sauce and leftover pumpkin from other things I'd made, then the idea came to me, what about a challah made with two doughs? One with pumpkin puree providing much of the hydration, and one with cranberry sauce providing much of the hydration. I thought the colors and flavors would make a really interesting combination. And, while I was at it, why not make it with my levain? 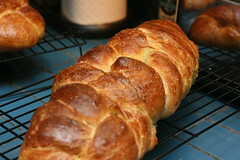 Having only made challah twice before, this may have been a bit ambitious, but why not! 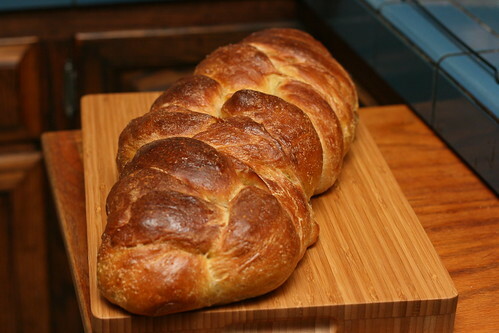 I decided to use the challah recipe in Bread Baker's Apprentice as a starting point, as I liked the loaf I'd made the week beforehand. I took a look at the hydration in the recipe and calculated out how much flour and hydration I wanted in the preferment, I had to estimate here as I didn't know what percentage of the pumpkin puree and cranberry sauce was water. The cranberry sauce definitely had a lower water content, and it also seemed to have somewhat of an inhibiting effect on the levain. I'm not sure why, but I have some ideas. It may have been the sugar and/or acidity levels of the sauce, or the lower availability of water because there was less water in the sauce. The more mundane reason, it could just be that I forgot to get the cranberry sauce to room temperature first (not to mention our house is colder than room temperature) so the cold starter and cold cranberry sauce may have just stayed cold much longer, as the cranberry dough did rise at the same speed as the pumpkin on the final rise. Time: 2 days. First day: Pumpkin and Cranberry starter. 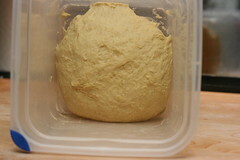 Second day: mix final dough, ferment, degas, shape, final rise, bake. 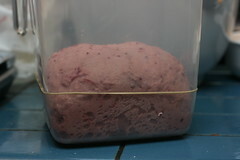 Mix the starters: ‘Cream’ the levain with the water and cranberry sauce, and water and pumpkin puree. 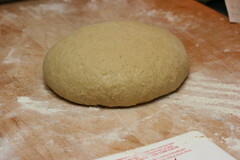 Then mix in the flour until the dough forms a loose ball. Let rest 5 minutes, and then knead for 3 minutes to ensure adequate mixing. Place each starter in a lightly oiled container or bowl. 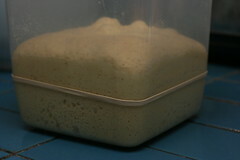 Leave the starters to ferment: Leave the starters in a room temperature place to rise until nearly doubled, degas the starters and refrigerate unless you will be finishing the dough then. If refrigerating, remove from the fridge at least an hour before you start the final dough. Pre-mix ingredients: Stir together the flour, sugar and salt (and spices for the pumpkin dough), and mix the starter with the oil, water, egg and egg yolk (making it wetter so it will more easily mix with the dry ingredients). 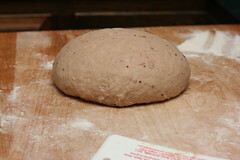 Mix everything into a dough: For both doughs: pour the liquid ingredients with starter into the dry ingredients and with a large spoon, dough whisk, or a stand mixer, mix until a ball forms, adding additional water or flour as needed. 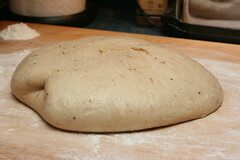 Knead to develop gluten: Knead for about 5-8 minutes, or until the dough passes the windowpane test. 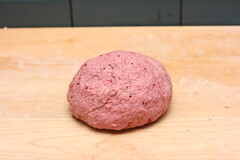 Once again, do this for both doughs. 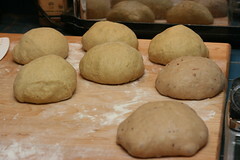 Once kneaded, place each dough in a lightly oiled container or bowl with a cover. Degas both doughs after they have nearly doubled: Gently remove them from their bowl or container, turn them out onto a lightly floured surface, and degas. After degassing, divide each dough piece in half, (or any other even numbered amount, or any other division you want, however you need equally sized pieces unless making a double braid) form into a rough boule and let sit a few minutes to relax. Shape boules into strands: Roll the boules out into strands, spend a little bit on each one then move to the next so the first has a chance to relax, until you end up with strands an appropriate length for the braid you plan on doing. 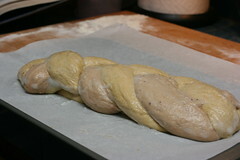 Braid loaf as desired: I’m horrible at braiding so I’m not going to try to give advice on it! 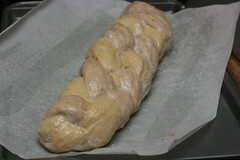 After braiding, place the loaf on parchment paper on a baking sheet and brush loaf with 1 egg white whipped until frothy, saving the remainder for after proofing. Proof loaf: Place loaf on sheet in a food safe plastic bag, or spray some plastic wrap lightly with oil and cover the loaf with the wrap. 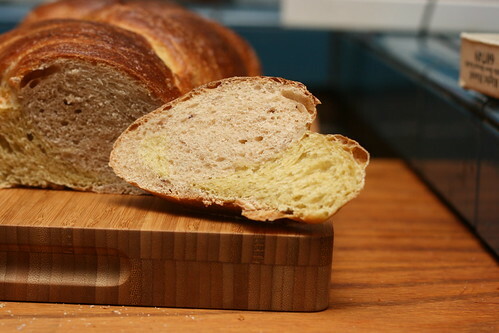 Leave the loaf to proof at room temperature until about 1 and a half to twice its original size, about 1-2 hours depending on room temperature and your starter. Preheat oven to 350°F: Just before placing the loaf in the oven, brush again with the egg wash and top with any seeds or other garnishes you like. 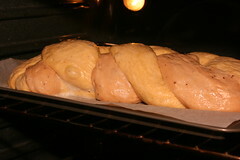 Place the loaf in the oven on the middle rack and bake for 20 minutes before rotating the loaf 180°, continue baking for 20-40 minutes until the loaf is golden brown and measures about 190°F in the center. 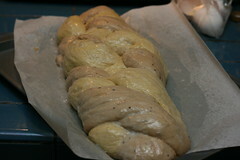 When done, remove from the oven to a cooling rack, and let cool for 1-2 hours before slicing. 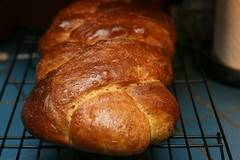 This challah was really awesome, great flavors, and great colors! You may want to increase the amount of the spices some, it was just barely enough in my opinion. But you don't want it to overpower the other flavors. I made some french toast with this bread, while we normally only use cinnamon, I added ground cloves, nutmeg, allspice, and ginger to the mix this time. 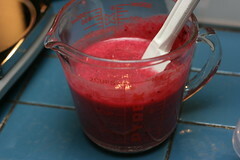 It was like pumpkin pie french toast, but with a bit of fruity overtone from the cranberry. Definitely a good bread for the fall holidays. 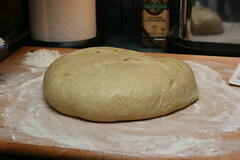 Note: As with my last bread, this one can be made as a straight dough, rather than sourdough. 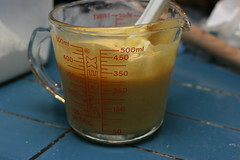 Just mix everything in one step, add about 2/3 tsp yeast and add .3 oz. flour and .2 oz. water to compensate for the lack of levain. And my second recipe submission YeastSpotting . I really enjoyed this one and hope other people enjoy it, or are inspired to their own creation!